The election is tomorrow! We round up some of the strangest ads we've seen this election season. By Dan McQuade·	 5/19/2014, 10:19 a.m.
Election Day is almost here! 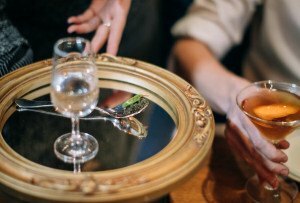 Tuesday is Pennsylvania primary day, so politicians will be ceding television commercial breaks back to their usual occupants (ads for drugs, beer, cars, etc.) for a few months — until general election commercials start. For the past month, seemingly every commercial break has been clogged with ads that are ridiculous in one way or another. (Another possibility: I just happen to watch a lot of TV that’s generally aimed at old people.) I guess I’m tired of them, but I’m going to miss the ridiculousness of a lot of the spots. Maybe it’s because they all use the same cliches, but there’s something about political commercials that is just hilarious. Here’s a roundup of some of the more notable ones from this election season. According to a poll released last week, Tom Wolf has a 20-point lead on the rest of the field and will cruise to victory on Tuesday. But that hasn’t stopped his opponents from trying. But this Rob McCord ad, essentially accusing Tom Wolf of being besties with this racist dude, apparently wasn’t able to make a dent. There’s been some push-back against this ad from many people — politicians love to whine — but it could have been even better. At a debate, McCord compared Wolf to Donald Sterling! I like Katie McGinty, because she goes by Katie instead of Kate or Kathleen or whatever. How many politicians are named Katie? I like this change of pace. Anyway, in this commercial McGinty notes she has the support of noted Oscar-winner Al Gore. Maybe she can win the popular vote but lose the election somehow! And here’s a Tom Wolf ad where he gets a bunch of people who work at a company named after him to say nice things. Also, please note that Jeep is a 2006 Wrangler Golden Eagle edition; if it is indeed black — and it looks like it, though it could be dark blue — Wikipedia says only 1,675 were ever made! And who compares a Jeep Wrangler to a Dodge Ram pickup anyway? But the GOP isn’t just sticking to the airwaves. Here’s a mailer a friend in West Philadelphia received. 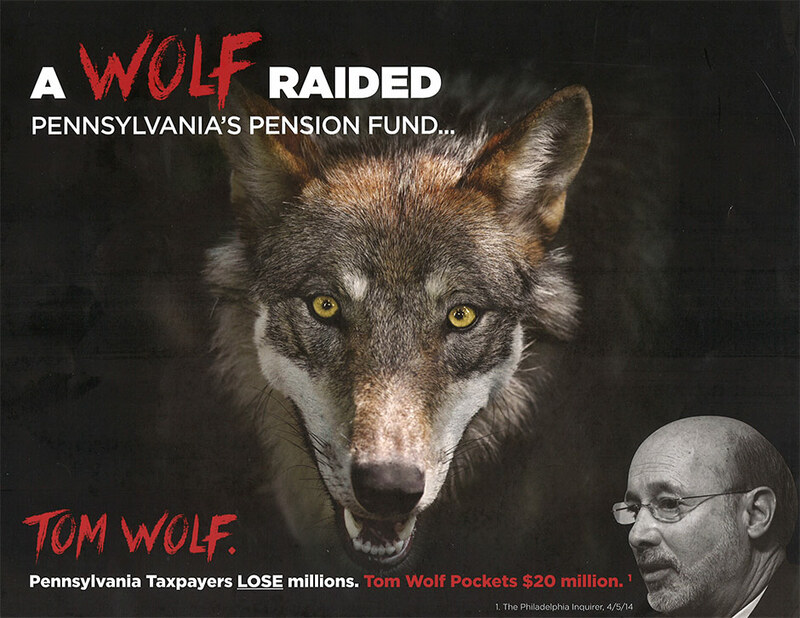 Oh, yes, Tom Wolf isn’t just a politician: He’s an actual lycanthrope who can turn into a wolf at will and feed on … money, I guess? Yeah, sure, why not. Aw, look, this one has a sheep on it! So cute. 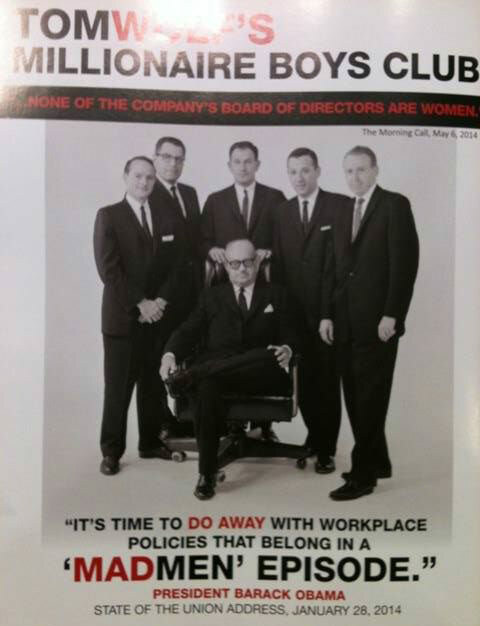 Here’s another mailer from the GOP. Personally, I would have used a Game of Thrones reference — “A Corbett always pays his debts,” or whatever — but I suppose Mad Men is still fairly popular. And that’s about it; Allyson Schwartz has no over-the-top attack ads, cabinet factory worker plugs, or ex-Vice Presidential endorsements I could find. Feel free to use these ads in selecting your candidate tomorrow! Or, actually — don’t.